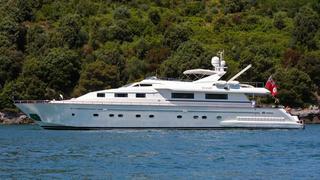 Mike Carlson at 26° North Yacht Sales tells me acted for the buyer and seller in the sale of the 30.7m motor yacht Unreel. Built in 2000 to RINA class by Italy’s Falcon Yachts and refitted in 2007, she’s a semi-displacement yacht with accommodation for eight guests in a full beam master suite, VIP stateroom and two twin cabins, each with a Pullman berth. Twin 1,800hp MTU engines give Unreel a cruising speed of 18 knots.